A Beautifully Remodeled Beach Bungalow Steps from the Surf! 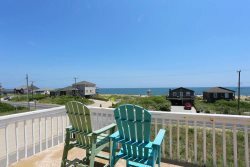 Located just steps from the shoreline of the Atlantic Ocean, Sound Sea Secret is a recently remodeled vacation rental home situated in the heart of Duck, North Carolina. This spacious 3-bedroom beach bungalow boasts beautiful decor and furnishings throughout the residence that are sure to make you feel right at home during your stay on the Outer Banks. Everything from the bungalow’s furniture and bedding to its smart TVs and kitchen supplies are all brand-new for the 2018 rental season! Spend your vacation at Sound Sea Secret and you’ll be treated to a short walk to the wide expanse of sandy Outer Banks beaches that await you, directly at the end of the street! The beach access is less than 500 feet from your front door, so you can simply pack up your beach gear and take a 5-minute stroll down Sound Sea Avenue to spend a day of fun in the sun along the seashore. A Vacation Home with Something for the Entire Family! Sound Sea Secret has been outfitted with a new front deck and all new deck furniture, so you can kick back and relax in the sunshine during the daytime or lounge outside in the evening while you bask in a cool sea breeze blowing in from the nearby shoreline. For your ultimate convenience, this vacation home features a fish-cleaning station and a gas grill, which makes cooking up the catch of the day at home an easy and fun experience for the whole family. Plus, this cozy beach bungalow also offers a large front yard with lush grass, a picnic table and umbrella, so you can enjoy al fresco dining without even having to leave the property! Do you have a four-legged family member you wouldn't dream of leaving behind while you spend a week at the beach? Sound Sea Secret has you covered! This dog-friendly vacation rental home in Duck welcomes your furry friend to accompany you on your Outer Banks vacation this year. And with its well-maintained yard and superb location toward the end of a quiet side street with minimal traffic, you’ll have plenty of space to safely walk with Fido while you’re here! In addition to its prime location just a short walk down the street from the pristine beaches of Outer Banks, Sound Sea Secret is also conveniently located just a 10-minute drive from downtown Duck. Known for being one of the most family-friendly spots on the entire Outer Banks, this charming coastal community is home to a wide array of delicious dining establishments, unique boutiques and retail shops, and water sport rental companies—as well as an 11-acre park complete with nature trails, kayak launches, a picnic shelter, a playground and an amphitheater where dozens of outdoor family-friendly events and activities are held throughout the year. Downtown Duck also features the popular Duck Town Boardwalk, which runs along the edge of the waters of the Currituck Sound. This mile-long wooden boardwalk connects to an assortment of waterfront shops and restaurants, and it also offers spectacular views of the shallow waterway that separates the island from the North Carolina mainland to the west. Stop by the boardwalk in the early evening to capture an incredible display of colors in the sky as the sun sinks into the sound at sunset. There’s no better place in Duck to witness a better view! With its amazing location just steps from the seashore, its assortment of on-site amenities and its close proximity to dozens of Outer Banks restaurants and attractions, you can’t go wrong when you choose Sound Sea Secret for your next escape to the barrier islands. Book your stay at this beautiful dog-friendly vacation rental home in Duck today! One Level: Living/dining area, kitchen, bedroom with king bed, bedroom with queen bed, bedroom with a pyramid bunk, and one shared bathroom. Smart TVs in each bedroom and in the living room. New stackable washer/dryer unit. Shed in the backyard has a corn hole set available for guests to use. We stayed at Sound Sea Secret in Sound Sea Village. The home was recently renovated and done with a great attention to detail! We really enjoyed our stay at this home as it was very comfortable and definitely showed pride in ownership! The community of Sound Sea Village is reminiscent of the outer banks back in time with its gravel roads and rustic beach! The managing agent was very responsive and accommodating to our needs!